Wario in a boss fight against Brawl Doll. 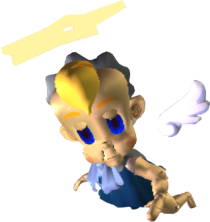 Brawl Doll is a cherub-like possessed doll that Wario fights in Horror Manor during the events of Wario World. When Wario first encounters the boss, deep in the basement of the creepy mansion, the Brawl Doll is facing away from Wario. It will then open its eyes and eerily spin its head around to face Wario. Its arena is a large, circular platform similar to that of Bouldergeist, but has three torches scattered around it, along with colored patches on the ground, resembling a play pen. This is the only time in the game that pillars are shown with fire in them. Brawl Doll has three varying attacks. The most basic attack is a swipe of its angel-like wings: first left, then right. This attack becomes faster for each health skull icon that it has lost. Brawl Doll uses uses its second attack after it has received damage. It will fly to the edge of the arena and fire lasers at Wario, similar to the blue Gem-Bodied Creature's attack. As Brawl Doll takes more damage, it fires a trio lasers that move in more erratic patterns. 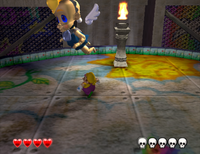 Brawl Doll begins to use its final attack when it has two health skulls left; it will start sliding across the floor at a very fast speed at Wario while drawing in red energy. This is its most powerful attack. If Brawl Doll is stunned during this attack, it will drop a ring of coins. Wario must knock the possessed doll out of the sky with either a Corkscrew Conk or by using one of the nearby Columns. After Brawl Doll is stunned, Wario can pick the doll up and use a Mad Move on it. After Wario attacks the demented figure five times, he is granted access to Wonky Circus. According to a variety of screenshots and early footage, Brawl Doll's eye color seemed to have been planned to be red. It is unknown why this was changed. This page was last edited on February 5, 2019, at 16:08.